Amazon is offering free Amazon Prime memberships to college and seminary students with a student.edu email address. Amazon Prime gives you unlimited free two-day shipping on most orders or overnight shipping for just $3.99. The cost of an annual membership is usually $79 so this is a great deal for students. If you are looking for textbooks, you can visit their textbook page here . German and French until 9:00 p.m.
As soon as my bed room door is shut I get into my dressing gown, draw up a chair to my table and produce, like Louis Moore, note book and pencil. Here I write up my diary for the day, and then turning to the other end of the book devote myself to poetry, either new stuff or polishing the old. If I am not in the mood for that I draw faces and hands and feet etc for practice. This is the best part of the day of course, and I am usually in a very happy frame of mind by the time I slip into bed. A Christian family from Germany have been granted political asylum in the US after facing the threat of prison for home schooling their children. Uwe and Hannelore Romeike, who are evangelical Christians, were forced to flee Germany as they wished to educate their five children at home. Home schooling is still illegal in Germany under laws introduced during the Nazi era. The German law means that parents who choose to home school their children can face fines or even imprisonment … The family endured harassment from the authorities, and on one occasion police officers came to the family’s home and forced the children to attend school. The family fled to the US after Germany’s highest court ruled that in severe cases of non-compliance social services could remove home schooled children from their parents. The Romeike family were represented by the Home School Legal Defense Association (HSLDA). Ejected. Umpire Don Briggs ejected the entire crowd at a high school baseball game. He said he had no problem with the players but ejected the crowd of over 100 for being unruly, yelling and arguing. Charming. Would you send your child to this school? 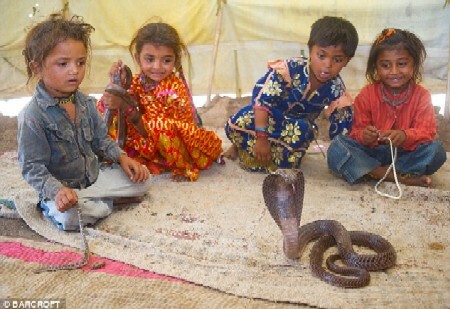 Children in this Indian village attend snake charming school as early as age two. Vacation Delay. Officials at Dickson Elementary School in California announced that students would have to attend an additional 34 days of school this summer due to a clerical error. Thursday, June 17, was supposed to be the last day of school. Now the students will have to wait until July 31. The error? Their early release days were five minutes too short to count as official school days. Christianity Today reports on how the current financial crisis is affecting seminaries in the United States. Salt Lake Theological Seminary in Utah officially closed in October, although faculty and staff are continuing to work on a volunteer basis to allow graduating seniors to complete their degree programs. Larger seminaries are also feeling the pinch, including my own alma mater, Gordon-Conwell Theological Seminary. With the stock market dropping 50 percent by November from its October 2007 peak, schools that rely on endowment income remain the most vulnerable. Dennis Hollinger, president of Gordon-Conwell Theological Seminary, said the school lost $600,000 in endowment income in 2008. Some restricted endowment gifts have gone “under water,” meaning they are now worth less than the original gift, and the seminary cannot spend from the principal. Hollinger said the Massachusetts school has cut close to $1 million from its budget of $20 million by canceling activities, realigning programs, and declining to replace departed staff. The school also closed its full-service bookstore, though a smaller shop will continue to sell textbooks. Other schools discussed in the article include Southern Baptist Theological Seminary (SBTS) and Trinity Evangelical Divinity School (TEDS). Please continue to pray for families, churches, seminaries, students and businesses during this time of economic stress. Piedmont College professor Barbara Brown Taylor laments her Christian students’ lack of knowledge of church history and tradition. College students in all other regards, they remain fifth graders in religion. How, when they meet someone who asks them intelligent questions about their faith, will they come up with equally intelligent answers? Keep your class notes, I tell them. You never know when you may need them. Dr. James Stobaugh has put together a helpful series of posts answering frequently asked questions about the SAT 1 (Scholastic Aptitude Test), PSAT (Preliminary Scholastic Aptitude Test), and the NMSQT (National Merit Scholarship Qualifying Test). 1) What is the SAT 1? 2) Should I take practice Sat I tests? 3) What are the PSAT and NMSQT? 4) Should I Take the PSAT? 5) How important is stress reduction? 6) How is the 2005 SAT 1 different from other SATs? 7) What About Learning Disabled Students? Here is one example of a typical test-day schedule. Times will vary depending on the actual time of the test, how far away the test site is, etc. The California ruling that appeared to declare most homeschooling in that state illegal has been vacated, and the case will be re-heard. Pacific Justice Institute has the details. Pacific Justice Institute has just received word that the court ruling which declared most forms of homeschooling unlawful in California has been vacated. This means the Rachel L. decision, which has sparked a nationwide uproar, will not go into effect as it is currently written. The Second District Court of Appeal has instead decided to re-hear the case, with a new round of briefings due in late April. It would likely take the court several additional months to schedule oral argument and issue another decision. The Intellectual Devotional is … a collection of 365 lessons that will inspire and invigorate the reader every day of the year. Each nugget of wisdom is drawn from one of seven fields of knowledge: History, Literature, Philosophy, Mathematics & Science, Religion, Visual Arts, and Music. I would prefer to call this a Daily Reader rather than a Devotional. Still, the concept is neat, and this looks like a great resource for strengthening your knowledge in a variety of fields. The inheritance is theirs because they are the heirs. Definite has 2 i’s in it. Cemetery has three e’s – “eee!” – like a scream. Slaughter is laughter with an “s” at the beginning. Br! It’s February in New England. Stationery: Remember “e” for envelope or “er” for letter. And if you have trouble spelling “mnemonic,” just remember: There is an “m-n-em” at the beginning of mnemonic!